I call it the trifecta of despair – Xmas – New Years – Birthday. They all come within a 12 days period with a long lead-up, usually starting just after Halloween. For some it is considered a wonderful time of the year and I’m real happy for them. I, however, having had a long dysfunctional history with them, they fill me with dread. When you combine that with the usual cloudy, rainy, cold weather of the West Coast of B.C., well you get the picture. And, oh yeah, I work for Canada Post which inflicts its own particular torture at this time of year. After years of just suffering through, I decided to take things into my own hands and just vacate my life, at least by my birthday at the beginning of January. These awesome trips gave me respite from the physical and emotional stress of the season. December became bearable because of the carrot dangling at the beginning of January. For several reasons I chose not to do that this year – big mistake. The last week of December I was hanging on by the skin of my teeth, frantic for a distraction. France in October was but a faint memory in the face of all this baggage. Must. Get. Out. Of. Here… but how? I had no vacation booked and my supervisor is not at her most generous this time of year. I took to AirB&B and scoured their site looking for a place geographically near but far psychologically. I found Todd’s B&B in Gibsons on the Sunshine Coast. Hmmm, he’s an artist, has a Llama, the space looks modern and private… a few back and forth emails and BAM! I’m going to Gibsons for the weekend! Yippee! 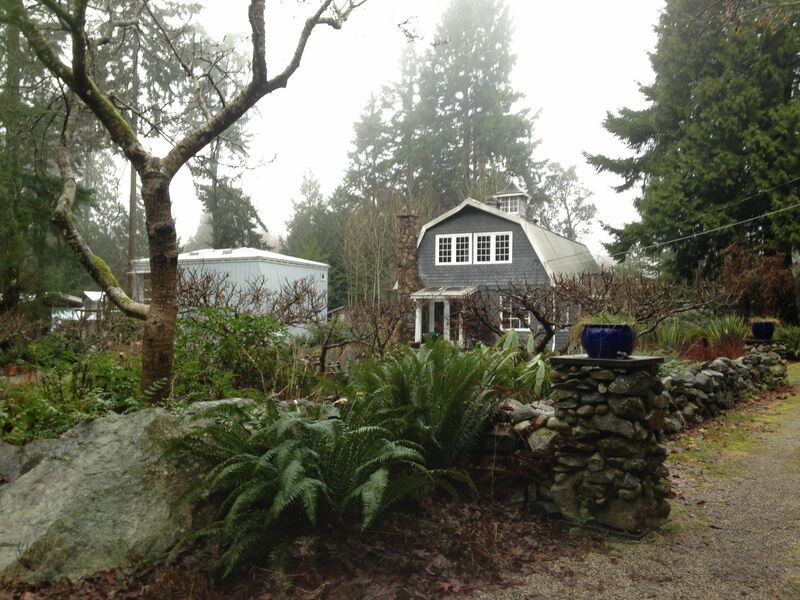 Forty-five minute ferry ride took me from my intense urban reality to January rain forest rural zen. See video of the ferry ride… don’t worry, it isn’t the whole thing: http://youtu.be/w0Qzd99cdBA As I rolled off the boat I could feel my shoulders lower from around my ears, their post of late. At 2pm tall lush evergreen trees and mountains eclipsed the weak winter light. The rain eased up enough for me to wander around the village checking out the die-hard shops not closed after the holidays. Charming, many offering locally made products, with anything blackberry being a favorite. View of the harbour from a shop. Heritage home along the main street. 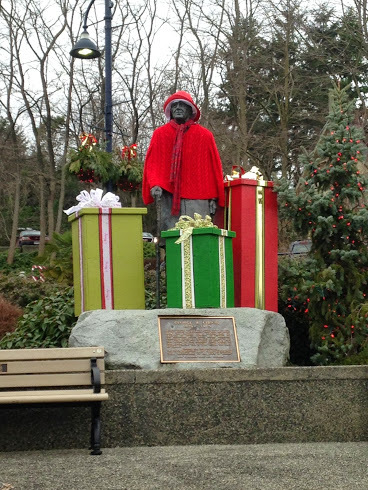 The statue of George W. Gibsons, founder of the town, stood in all his glory in his bright red xmas sweater and toque. Yes that is an actual sweater and toque. 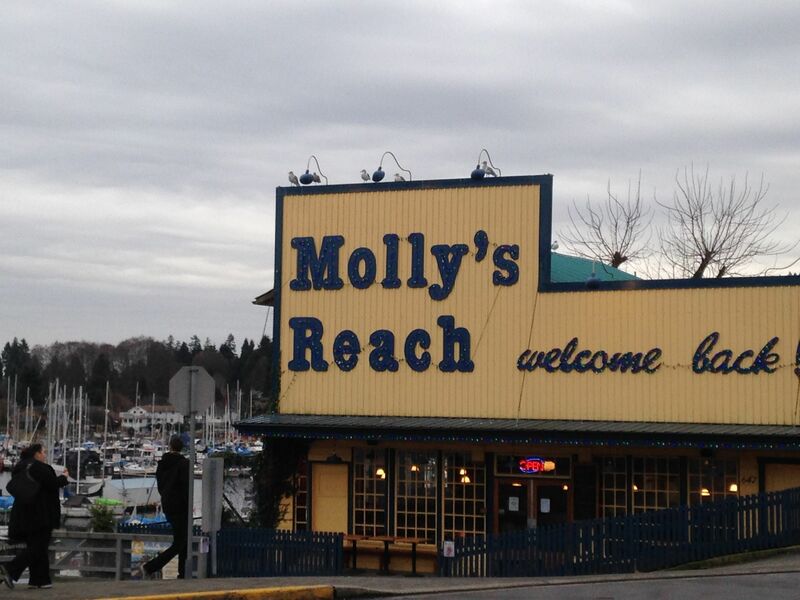 I was gratified that Molly’s Reach Restaurant had endured, a legacy of the favorite CBC TV show that ran from 1972 to 1990, The Beachcombers. The building was a prop for the show and wasn’t turned into an actual restaurant until after it was cancelled. I have fond memories of that show, my first introduction to Canada’s West Coast. As light gave up the fight I turned off the highway on the way to the B&B… hmmm this must be the suburbs, eh? Another left put me on an ever diminishing road as if losing ground to the crowding towering evergreens. Concern I would miss the address in the dark was groundless. A huge silver metal gate on the driveway and the horse trailer out front announced I had arrived. I eased the gate open and slipped through into an alternate reality. It was a compromise between the wild and wholly rain forest and the cultivated spirit of a garden, managing to respect both. Sculptures were tucked into settings and paths wound their way to different destinations – main house, studio, barn. Coming out to greet me was 2 peacocks in all their glory! Peacocks! Even in the dim light they were glorious. Todd’s B&B – their house is to the right, the studio to the left. Todd’s wife, Carol, was doing barnyard chores while Todd had the radio blasting in his studio as he worked. It was all just pretty darn cool and I could feel me slipping into this reality. They got me tucked into the loft above the studio, a stylish sleek modern room. Seven hundred square feet of uncluttered space. The walls were hung with original art and there was a glass garage door that opened a large part of the wall to the glorious outdoors. This is a summer space for sure but it was just the ticket for me this winter weekend. I raised the garage door in the middle of the rainy night to experience it… glorious! Looking out into that dark primordial forest I wondered what was out there hidden from view. Have you ever been in a rain forest in the rain? It is soft. You are surrounded by towering cedars, hemlocks and spruce, multiple hues of the darkest greens. Rain drops on Chartreuse moss creates sparkly sun beams in the dim light. Ferns sprout anywhere they can glom onto – dead or living trees, cracked boulders and in the ground. Dense beds of fallen needles help ferment a lush scent that echoes hundreds of years of history. Constant wisps of mist smudge. The drenched air strokes your skin and lungs – the antithesis of desert air. Like I said – soft. I went to Gibsons for peace and quiet, right? Well my home is clad in cool industrial metal. Rain hitting metal creates a cacophony that had me reaching for my earplugs. Sunday morning had the rooster giving us a polite wake-up call but on Monday morning he seemed determined to crow until the sun came out – a fool’s errand to be sure. I just had to laugh at the irony. 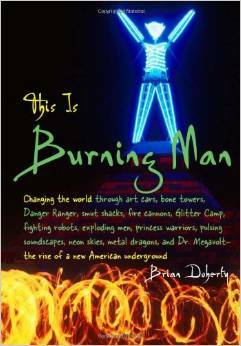 I discovered a book called “This is Burning Man” by Brian Doherty on the coffee table. I could not put the darn thing down, gobbling it up in 2 days. I suspect the Goddess may have sent me to Gibsons just to find this book, it is that important. Little things can shift us in big ways and gift us with a whole new perspective. That is what it did for me. Have you ever had a book do that for you? Have you been to Burning Man? Cabin fever drove me out Sunday afternoon to Sechelt, about 25 minutes north of Gibsons to indulge in a sumptuous massage. Located in Michelle’s home, it was a huge room with a fireplace creating just the perfect ambiance. Do yourself a favor and treat yourself to one of her massages at Lily Peace Massage. She will even come to your B&B! How is that for decadence? I topped off my visit with a brisk walk along Sechelt’s sea wall in the rain; lovely and wild it was a perfect counter point to my massage. Invigorated, I returned to my nest and my book. These weekend getaways may traditionally be for the couples but I don’t think they should be so greedy, they are perfect for solo flyers too. Though I do wish people would stop being so surprised that I do them alone. Like, really? I am such a lucky girl to be able to give myself adventures, small and large because they nourish and inspire me. How about you? Single weekends getaways? I think it is an untapped market for the travel industry. I am still working on the idea of a weekend getaway in my own back yard. However it is challenging to turn everyday life “off” at home! This is really great and I agree, getaways shouldn’t be just for couples. Even just a quick next town over getaway is replenishing for the soul. I’ve even been known to book a hotel in town just to escape my normal daily process for one night. In fact, I still do it now and then even though I’m married now. I soul-fulfilling day/night away is better than therapy. Sounds like a terrific weekend getaway for sure. By the water, a rainforest, quaint litte town. Perfect and relaxing. Pretty different from your reality, eh? It was wonderful, thanks for dropping by.